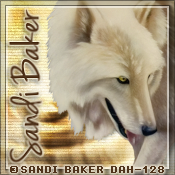 I am using the awesome artwork of Sandi Baker. Signature tag first, open a new image 600 x 250, fill with a color of choice. Do this a total of 3 times. Change the blend mode to hard light, duplicate, mirror. Paste your tube, change the blend mode to overlay and move over to the left more, duplicate, mirror and erase the part on both that covers the faces. Paste your tube again, resize to 50%, and paste more to the right. Once you are happy with this, merge visible and add your frame. as on the signature tag.